Nick Klase will discuss light in terms of what our plants need, how LEDs can meet those needs, and considerations when choosing a LED fixture. Tom Barr will speak -- twice -- about how to grow aquatic weeds. 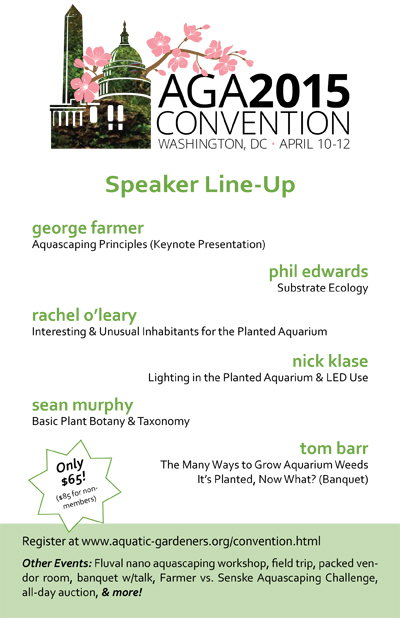 Rachel O’Leary will show us how to choose, use, breed and keep umm … interesting … inhabitants for planted aquariums. Does substrate matter? Phil Edwards says it does. Want to know why? Learn about the processes that go on in our substrates, and how to keep your substrate healthy. And, you can hear from UK aquascaper George Farmer about aquascaping principles - conception, design and execution. George will also demonstrate this live in a head-to-head aquascaping duel with Mike Senske of Aquarium Design Group.